Grab an opponent, hit them with the A Button two times, throw them towards the ground, then jump and perform an Up-Air attack. This generally results in approx. 20 damage. It's perfect for setting up combos. Get your opponent to the edge of the stage then unleash the final smash for a high chance of knocking them out. Edge hogging can limit this attack's success! If your opponent is using any move that leaves them vulnerable or takes too long to execute, use FLUDD on them and it will spray them of the edge or to their doom. This works great on Kirby's Stone or a hammer. He uses a big punch covered with fire for a smash attack. He uses his head to send foes in the air. He uses his legs to attack enemies around him. He uses a punch when attacking airborne foes in front of him. When Mario is running fast press to make him do a slide kick. When he walks press to make Mario kick something. + + + + Crouch Kick Mario kicks while crouching. Has moderate delay at the end. Fireball Shoots a projectile that causes 4% damage. Useful at long ranges to disorient your foe. + + + + Cape Reflects projectiles but only lasts for a second. You can also use it to turn enemies around when they're charging a smash attack. This confuses them and gives you enough time to pull a smash attack of your own. It also can be used for some horizontal recovery when in midair. + + + + Super Jump Punch Jumps up into the air and attacks opponent, also used for recovering. This attack leaves you very vulnerable in free for alls or if you do not connect correctly with the opponent as it gives your enemies time to attack while you are in midair. Even when it connects, the knock back isn't that great, so it's best to reserve this move for recovery. + + + + F.L.U.D.D. Charge up the F.L.U.D.D. When there are no opponents nearby, then fight them as you normally would do and knock them off the stage. Then use the F.L.U.D.D. to push the opponents back whilst they are trying to recover, this makes it harder for them to recover. He grows bigger, as if he'd gotten a Super Mushroom. + ( or )+ or or He spins around and takes off his hat. + He flips over in midair and falls down. Mario Finale: Mario releases a fast-paced barrage of flames in a wide vertical direction. 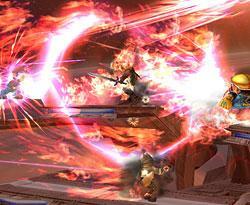 These flames stun opponents, while carrying them in the direction the row of fire is heading. 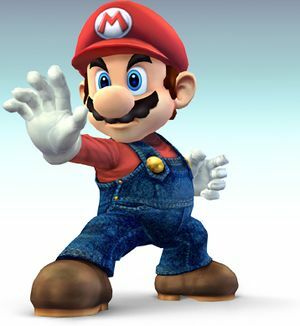 The Mario Finale does more damage the closer the enemies are to Mario, but when they are close, it is easier for them to dodge the attack and take no damage from it. Wasting the final smash. This page was last edited on 11 June 2013, at 01:05. This page has been accessed 34,352 times.